Late March in Nebraska is very much like it is here in Delaware…warm, cold, warm, cold, windy, windy, rain, snow. That is how our trip went last week in the Cornhusker State. We experienced a wild variety of weather, including temperatures in the 70’s when we arrived. That didn’t last. By the end of the week it was a high of 34 degrees and snow all day. The wildlife isn’t as variable as the weather luckily, and that was the reason 8 of us from the Delaware Nature Society made our way to the center of the continent last week. The main reason, and original draw for the trip is still the Sandhill Crane migration and staging of half-a-million birds on the Platte River. This year, as in the last 100,000 years, the Cranes descended on this shallow prairie river, and fed in it’s floodplain of corn fields. They captivated us, and brought us into their world of the wild for a few days, while they paused, rested, and fattened on their journey to the northernmost reaches of North America and even Siberia. Sandhill Cranes descend on the Platte River for the night after fattening in corn fields during the day. Away from the Platte River and the Cranes, corn, and for the most part, other people, is my favorite part of Nebraska…the Sandhills region. It is mostly an area that is unknown to Americans, but it should be. It is America’s Sahara and our last great, intact and functioning prairie ecosystem. When the wind blows here, it does not rustle corn stalks. Here you hear the swoosh of prairie grasses and the dried stalks of wildflowers. Rolling sand dunes, some as high as 400 feet overlook abundant wetlands at their bases, springing up from the Ogallala Aquifer lying just under the sandy soil. 20,000 square miles of sand dunes, prairie grass, wetlands and lakes, few people, and abundant wildlife define the Sandhills region, Nebraska’s greatest natural treasure. 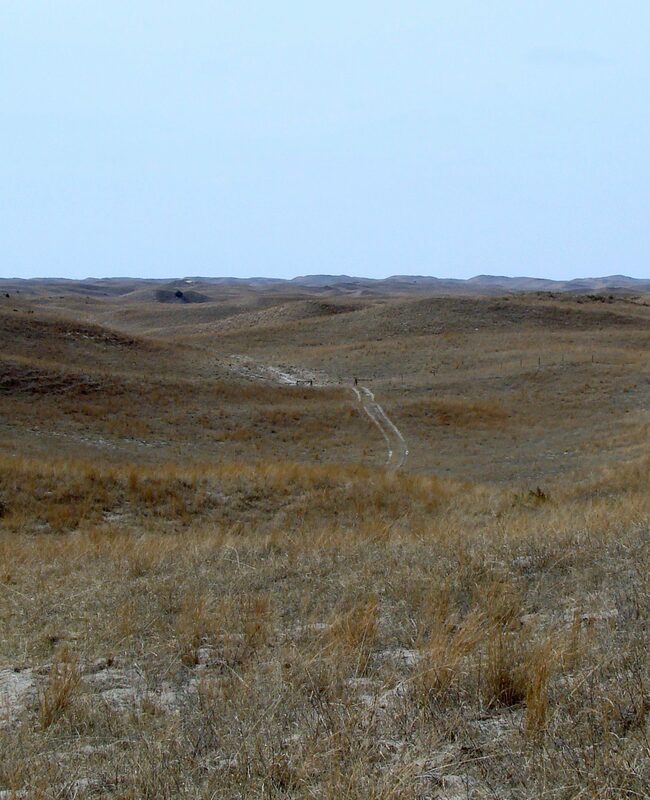 The Nebraska Sandhills are a 20,000 square-mile area of prairie-covered sand dunes with abundant wetlands. Few people and lots of wildlife characterize this special region...America's Sahara, and one of our last remaining intact prairie ecosystems. We stage our Sandhills experience at Calamus Outfitters on the Switzer Family Ranch. Here we watched Greater Prairie-chicken and Sharp-tailed Grouse perform their spring mating dances. An open-air jeep safari tour deep into the beautiful Sandhills landscape was cold, but exhilarating and educational at the same time. The nearby Calamus Reservoir and surrounding wetlands provided huge numbers of ducks, Bald Eagle, American White Pelican, gulls, and many other species to appreciate and watch. Join us if you can on a future trip, and enjoy the short video of highlights from our trip to Nebraska, March 2011. Oops! I forgot to add Wilson’s Snipe, Red-bellied Woodpecker, and Blue Jay. Also, the mammals we saw were: White-tailed Deer, Mule Deer, Coyote, Mink, Groundhog, Eastern Fox Squirrel, Muskrat, and Eastern Cottontail. For the first time ever on this trip, we saw a lizard…the Northern Prairie Lizard. 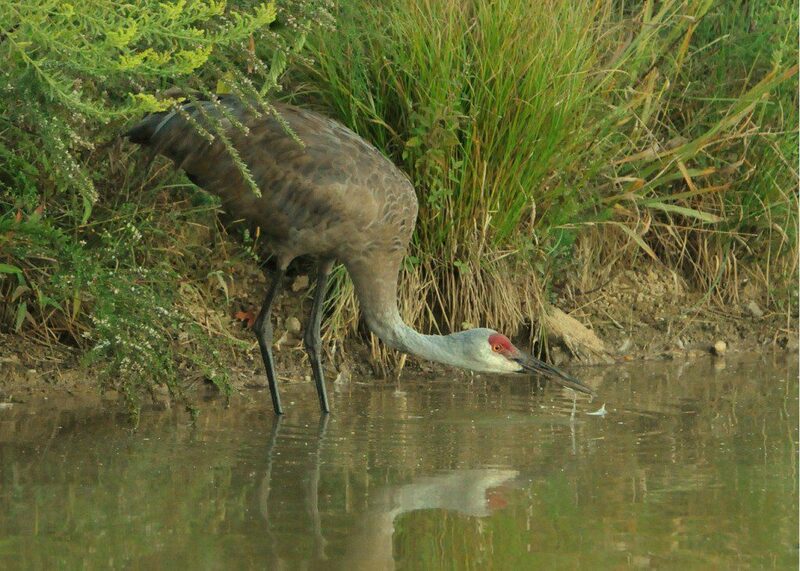 A Sandhill Crane wading the edge of a pond near Iron Hill Park, Newark, DE. 9/14/10. Image by Derek Stoner. 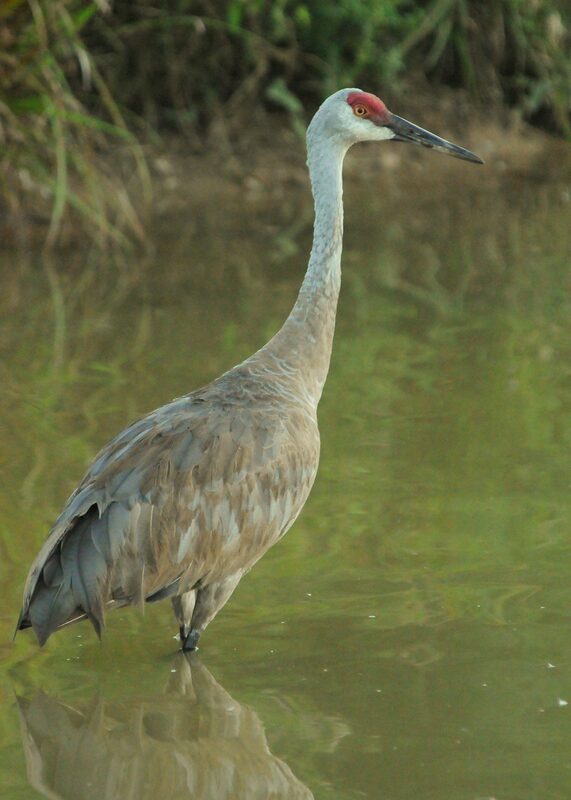 The email subject line caught my attention: FW: Sandhill Crane. Immediately intrigued, I checked out the photos that a kindly observer had passed along to me. While driving by a neighborhood near Newark, Susan Eggert had the amazing experience of spotting a crane waltzing across the lawns. Realizing that she’d spotted a very unusual bird for around here, she passed along the sighting and photos to me at the nature center. This pose is what "craning your neck" is all about! 9/14/10. Image by Derek Stoner. I drove down to Newark this evening with high hopes, and found the crane right in the spot Susan described. A classic neighborhood pond, surrounded by tall weeds and willow thickets, loaded with the ubiquitous Mallards. A group of young kids were playing around the pond and came running up to me. “Are you looking for the crane? The Sandhill Crane?” a six year-old girl asked me. The kids excitedly told me that the crane had been visiting their pond for the past three days. They’d had fun watching the bird as it hunted for food. They knew that cranes are very rare in Delaware, because they’d studied up on cranes after discovering their new feathered neighbor. They told me that the crane had just disappeared and that it was hiding in the tall grass. Sure enough, seven year-old Tyler soon jabbed his finger in the direction of the broom sedge thicket. Parting the stems like a gray shadow, a four-foot tall crane emerged from the cover. A Sandhill strolling through suburbia. A tad unusual in these parts! 9/14/10. Image by Derek Stoner. 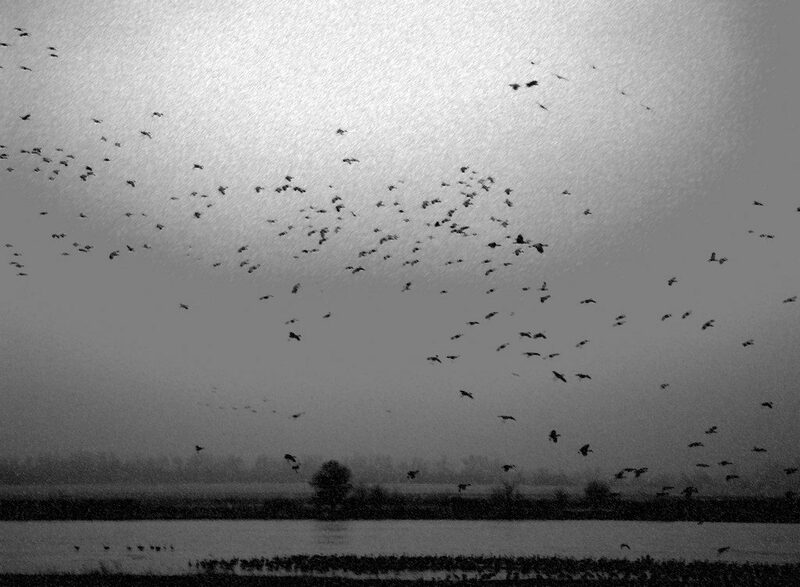 I stood at the pond’s edge at dusk, surrounded by ten wide-eyed and eager kids. I passed the binoculars around, and shared my photos with the young naturalists-in-the-making. Ten-year old Voni hopes to be an ornithologist someday and is fascinated by this incredible bird in her backyard. 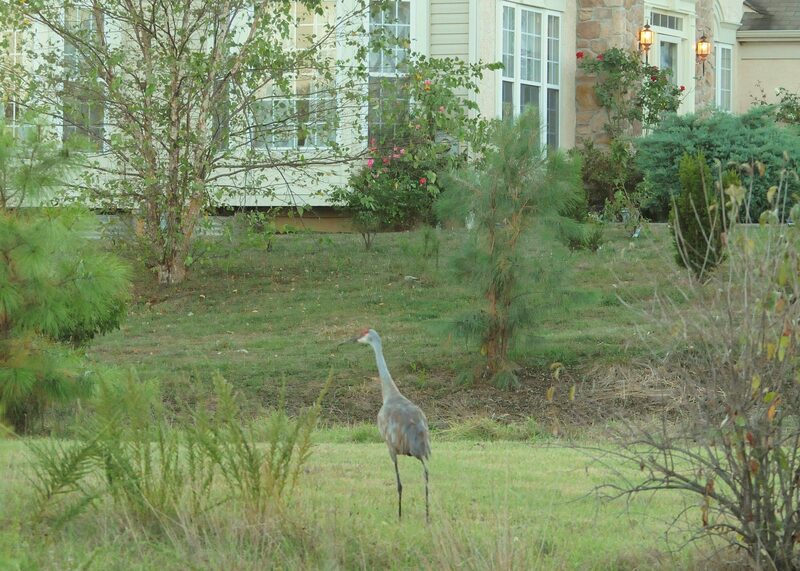 Can you imagine having an elegant crane waltzing around your yard? We watched the crane catch and consume a Pickerel Frog and a couple of small fish. The sinuous neck of the crane uncoiled as it took a long drink, submerging its head completely underwater. The crane’s bright orange eyes glowed fiercely between its red cap and pale gray face. A wild crane– wary and hunting for food amidst a pack of curious kids. The crane cautiously kept its distance from its onlookers. We spoke of the importance of respecting wildlife and how this crane is attracted to the food resources in their healthy pond. If they respect the pond, they will be rewarded with a rich bounty of wildlife to watch. 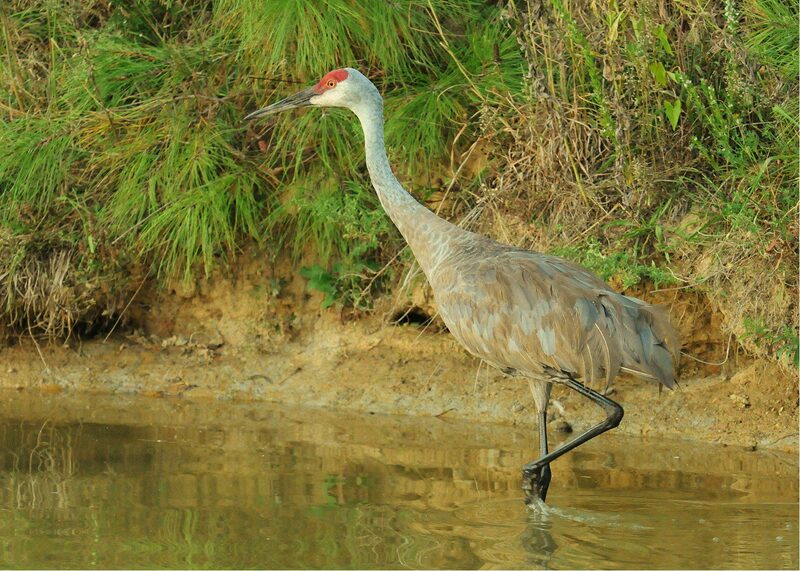 The Sandhill Crane is renowned for its elegance and grace. 9/14/10. Image by Derek Stoner. As dusk settled, I explained to the kids that cranes like to roost in shallow water and that it would probably spend the night in their pond. Perhaps in the morning they will see the crane catching its breakfast while they eat their cereal and gaze at the incredible wild creature in their midst. If you’d like to try for a suburban Sandhill Crane experience, I encourage you to go have a look. This is a unique opportunity to interact with people and demonstrate how a simple pond can be an important part of the survival of a rare visiting bird.